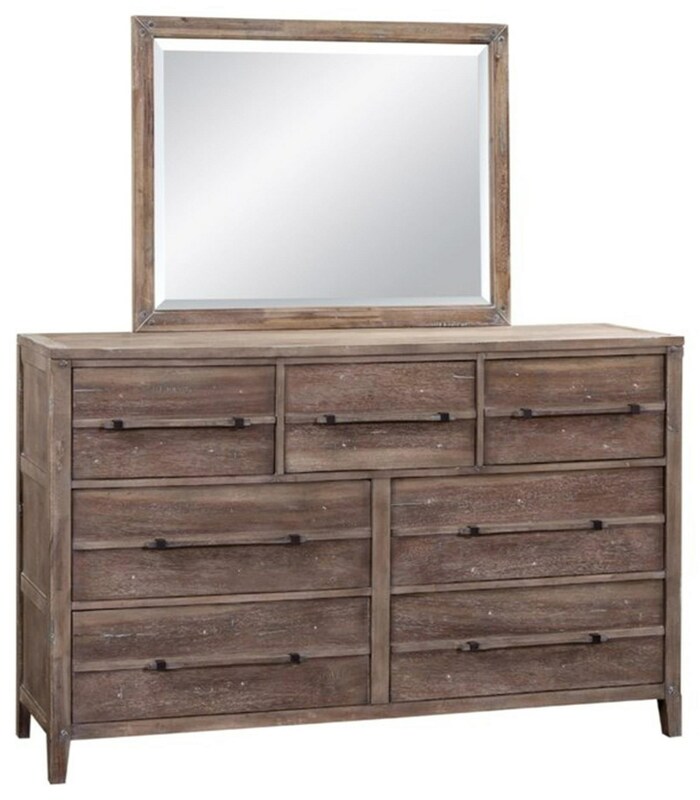 The Aurora Dresser & Mirror by American Woodcrafters at Great American Home Store in the Memphis, TN, Southaven, MS area. Product availability may vary. Contact us for the most current availability on this product. Handles & Hardware Wood pulls with metal bracket. Drawer / Shelf Construction 4-sided drawer boxes with English dovetail joinery in front and back. Felt in top drawer of chest and dresser. Drawer Suspension Roller bearing side guides. Case Construction Dust panels on bottom of all storage pieces to protect the contents. The Aurora bedroom group offers no shortage of storage solutions, all without compromising cozy style. In addition to the deep drawers of the dresser, chest, and nightstand, convenient drawers located in the footboard of the bed offer an easy place to stash extra blankets or pillows until you need them. The bed's gently sloping, slatted headboard brings character and charm into any bedroom, and the light weathered grey-brown coloration adds lift and airiness to elevate moods and enlarge rooms. Subdued hardware and wooden pulls complete the look, providing functionality with seamless visuals. The Aurora collection is a great option if you are looking for Rustic Transitional Casual furniture in the Memphis, TN, Southaven, MS area. Browse other items in the Aurora collection from Great American Home Store in the Memphis, TN, Southaven, MS area.